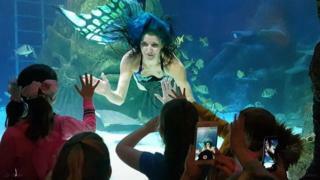 A woman crowned Miss Mermaid UK is taking the plunge to battle it out to be crowned winner in an international pageant in Egypt. Laura Hudson, from Lincolnshire, who goes by the name Mermaid Twinkle, has been making a splash with performances since taking the UK title last year. She will compete against 29 other mermaid fanatics in the unique contest which takes place over two weeks. The 29-year-old said: "It would be an absolute dream to win." In her role, Ms Hudson, from Donington, Lincolnshire, said she gets to make children's dreams come true, as well as raising awareness about marine conservation. She works as a professional mermaid, putting on displays and swimming in aquariums alongside sea creatures including sharks. Ms Hudson said she had mastered the art of free diving at deep distances and can hold her breath for more than four minutes. Being a mermaid was not just about about elegance and magic, but required a lot of physical fitness, she added. Many of the competitors have completed a special diving qualification to make sure their efforts go swimmingly. Miss Hudson said: "When you're holding your breath in free diving, you are at risk of hypoxia and blacking out so training is paramount. "We have to have good technique, be able to tolerate the temperature and be safe, hold our breath for a long time to perform tricks and stay down long enough to make it a show. "Also you need to look out for sharks and turtles in the water so we don't cause harm to them or ourselves." She said her most memorable mermaid moment was swimming with Ernie the turtle at the Sea Life Centre in Manchester. "He's very intelligent and knows when I'm getting ready to dive as he swims right in front of me," she added.